Taaa-daaaaaaaa! Ordered stuffs again online haha. And got new hair ties o(^^)o LOL! I know la, it looks childish, but i find them cute :> tooo bad haha. I gave the 'korrilakkuma' hair tie to zhimin. Haha, yup thats her favourite character currently, i guess. Cause she once said she prefer hello kitty ... hmmm .. So, click the banner above to visit my blogshop! 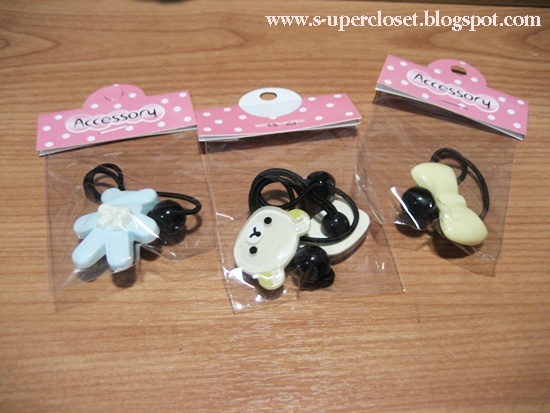 You can order the cute hair ties @ 3 for $10 o(n_n)o !! I'm not blogging about the hair ties just to make people buy it okay! Haha, its because i really find it cute. Its direct from korea. I opt for normal mail and it took less than 2 weeks to arrive. So yeap. Thats all for today. My batch of earrings have not arrive yet >: arghhhhh! Once they arrive, will post pictures of them haha. Ciaos~ off to write my english speech. Speech is rather easier to write then letter writing i guess. Idk haha i scared i got too carried away and end up rattling on and on and on in my situational compo and forget about my compo o(>.<)o NO WAAAAY!